Our itinerary together begins on San Cristobal Island and Puerto Baquerizo Moreno, the capital of the Galapagos Province. On our first afternoon, we visit Cerro Colorado, breeding centre of the islands’ famous giant tortoises amid a fantastic deciduous forest. We sail north overnight, to awake at the sunken caldera of Genovesa Island, a privileged place to visit amid thousands of marine birds. Back in the central islands, on Thursday we learn about Buccaneer Cove’s distant and recent history aboard our inflatable dinghies, before exploring the underwater realm, snorkelling or aboard the glass-bottom boat. Across the way, we disembark at the popular site of Puerto Egas, a great place to see land and marine birds amid a landscape of tuff-stone layers and lava flows. Motoring overnight, we find ourselves amongst the youngest islands of the Galapagos. Here, we explore Punta Espinoza with its amazing combination of barrenness and abundant wildlife. Highlights include hawks, penguins and the flightless cormorant. Later, at Tagus Cove, an uphill hike takes us to the rim of Darwin Crater and some lovely views, followed by an inflatable dinghy ride to spot local wildlife, a swim, kayak or snorkel. We continue our exploration of Isabela Island the following day, at Urbina Bay, the intriguing result of an uplifting of the ocean, home to large and very colourful Galapagos land iguanas, and then at Punta Vicente Roca with its abundant wildlife and, hopefully, sightings of green sea turtles. Sunday sees us anchor to visit the red beach of Rábida Island and its large colony of sea lions, marine iguanas, mockingbirds, yellow warblers, and several species of Darwin’s finches. In the afternoon, we visit the north shore of Santa Cruz, host to Cerro Dragón (Dragon Hill), home to land iguanas and with a trail that offers a beautiful view of the bay. Wherever we sail, whatever we do, all the crew aboard the Isabela II will do our utmost to ensure that your Galapagos experience is truly, deeply moving and memorable. We arrive by plane at San Cristobal Island and transfer to Yacht Isabela II for cabin assignment, introductory briefing and lunch. Overnight, we navigate northbound to the incredible bird haven on Genovesa Island, crossing the equator on the way. The morning starts with a panga ride along the cliffs of this dramatic island, followed by a dry landing with a steep climb (90 feet) up some stairs to reach a flat plateau. Along our walk, we can observe large colonies of Nazca boobies, red-footed boobies, great frigatebirds and storm petrels. Coastal exploration along the cliffs (depending on weather conditions) will let us see more wildlife, including Galapagos fur seals. 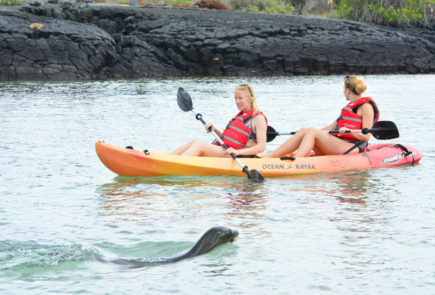 We can also enjoy snorkelling and kayaking. In the afternoon, we land at the beach for an easy stroll observing hundreds of birds, mainly frigatebirds, red-footed and Nazca boobies, gulls, herons, finches and mockingbirds. There’s an optional walk over sharp lava and uneven terrain for dramatic views, or else we can return to the beach to enjoy snorkelling at this beautiful natural harbour. After breakfast, we enjoy a coastal exploration along the impressive cliffs of Buccaneer’s Cove, learning about the area’s distant and recent history. The cove is home to a large number of marine birds, sea lions, and inter-tidal organisms. Enjoy fantastic natural formations such as the “The Bishop” and an impressive natural cave. This is a great site for snorkelling too or ride in our glass-bottom boat. This is a wonderful opportunity to see land and marine birds amidst a landscape of tuff-stone layers and lava flows. At low tide, marine iguanas graze upon the algae beds and we can also observe a colony of fur seals. Back at the beach where we land, there’s very good snorkelling and swimming here. In the morning, we visit the youngest island of the archipelago, Fernandina. Punta Espinoza has an amazing combination of barrenness and abundant wildlife. Highlights include hawks, penguins, flightless cormorants, and some of the densest colonies of marine iguanas. Snorkeling here usually bring unexpected marine encounters. Across the narrow Bolivar Channel, we anchor at this cove on the northwest of Isabela. It provided a favourite anchorage for pirates and whalers over the centuries. An uphill hike takes guests to the rim of Darwin Crater, filled with salt water and to a dramatic viewpoint. After our walk, we take a panga ride to spot local wildlife, including some Galapagos penguins with the possibility of swimming, kayaking or snorkelling. After breakfast we disembark at Urbina Bay, the result of an uplifting of the ocean floor in 1954. Here you can find corals, shells and many other calcareous organisms exposed above water. This area is also home to large and very colourful Galapagos land iguanas, and occasionally to giant tortoises. Along the shoreline, after the hike, guests may encounter flightless cormorants and see penguins while snorkelling. Since there is no landing site at this location, the coastal exploration is by skiff, while naturalists explain the dramatic geology of the area, with remains of lava flows and tuff stone layers. There is abundant wildlife and, depending on the conditions of the ocean, we’ll be able to snorkel along the cliffs, hopefully in the company of green sea turtles and penguins. Expedition plan for Sunday and dinner. In the morning, we disembark at Rabida Island’s red-coloured beach. A stroll allows us to observe a large colony of sea lions, marine iguanas, mockingbirds, yellow warblers and several species of Darwin’s finches. This is a great place to snorkel from the beach. We can also enjoy a panga ride, kayaking or ride in our glass-bottom boat. 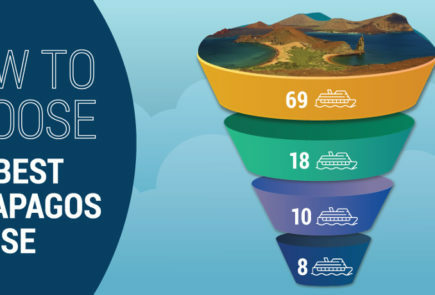 Shared transfers from main hotels in Quito (Casa Gangotena, Hilton Colon, Sheraton, Marriott, Dann Carlton) and in Guayaquil (Hilton Colon, Oro Verde, Hampton Inn, Sheraton) to airport for flights to/from Galapagos are included in these rates. To coordinate these transfers, we must have guests’ hotel contact information. 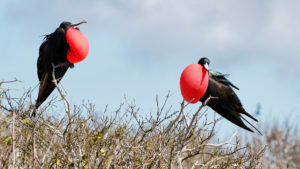 * Internet connections onboard consist in computer stations and wifi in the vessel’s social areas; due to the Galapagos’ remote location, internet connections are intermittent and low-bandwidth. ** At your request, we can include the Galapagos National Park entrance fee of US$100 and migration control card fee of US$20 (subject to change). However, please note that, due to administrative and operational reasons, these fees can only be included when guests travel on the operation departure date. This service does not apply for guests who travel before a departure date (even if the departure is with us). *** Please note, we charge guests who wish to bring bottles of wine and/or spirits aboard our vessels a corkage fee of $25+taxes.